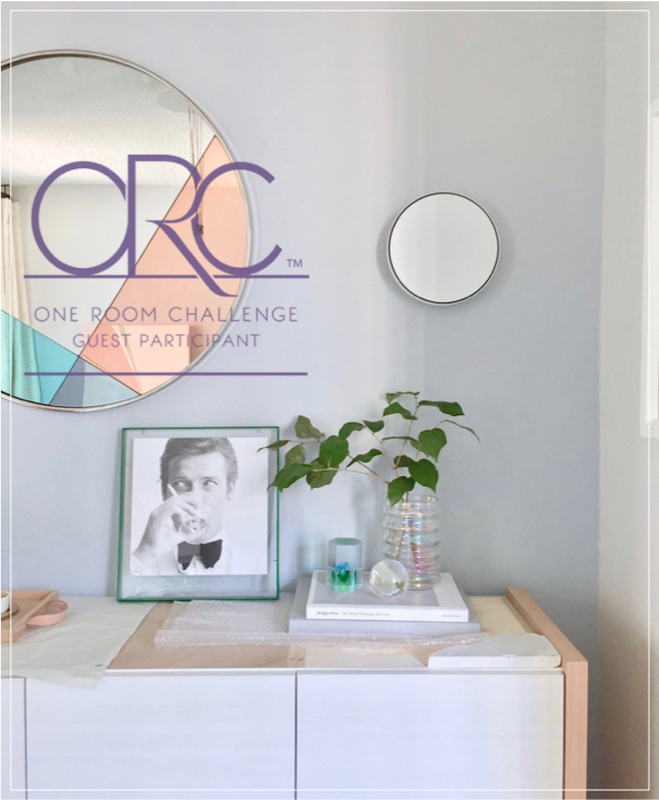 dWelcome to Week 5 of One Room Challenge! It's the home stretch and with the built-in finally installed, I am ready to focus on artwork, accessories, and some final touches before Stephani comes over to work her photo magic! For artwork, I know I want to frame up one of my "Shaken Not Stirred" and to make Mr. Bond proud in my dining room (perfect for the occasion don't you think? ), I opted to frame the print in acrylic, which led me to a the super sleek reference: contemporary. 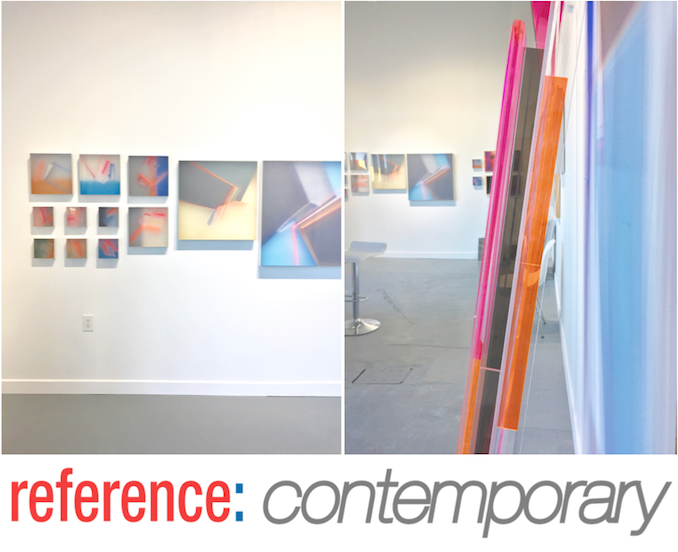 I met Maita of reference: contemporary at the outdoor art exhibition last summer and it was love at first sight with Kal's work. So I was very excited about the studio visit to see what Kal and Maita have been up to and see if they could help me with acrylic framing. I just love the intricate layers and attention to detail from panel composition to color combination. 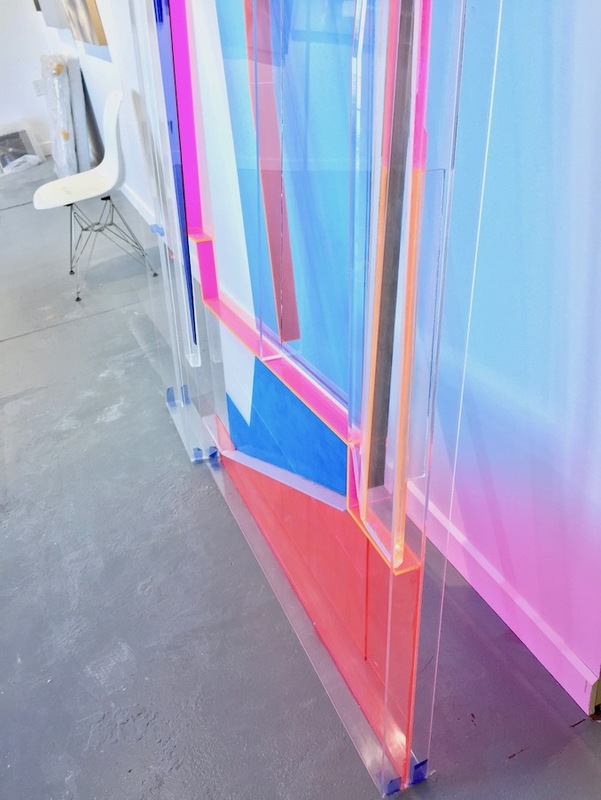 Kal is a true master who transforms ordinary acrylic sheets into spectacular art creations. As for my acrylic frame, here is a little sneak peak! 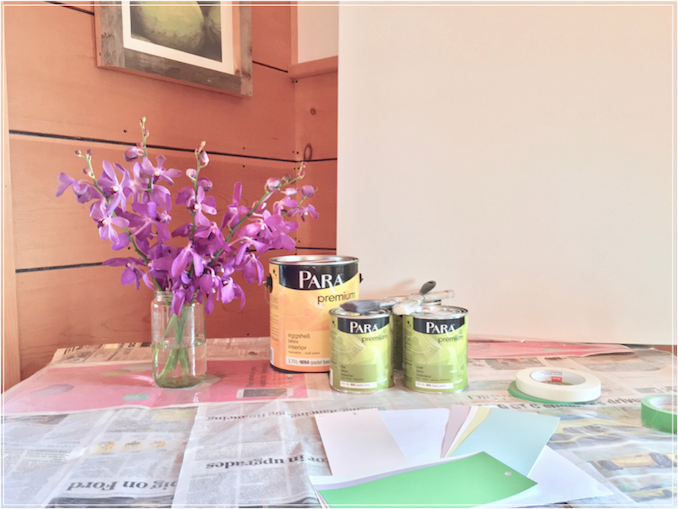 Mesmerized by the geometric lines and vibrant colors of Kal's masterpieces, I decided to paint a canvas for my dining room with lots of help from Para Paints. Besides, I figured since I was taking a few days up north to rejuvenate before the final push, I might as well be also inspired by nature and be creative. I selected my colors from the fan deck (7 colors to be exact), and I actually didn't do a mock up of what I set out to print. After a couple of days of taping, re-taping, and paint brush washing, I am very happy with my creation and I think it's pretty perfect for the space: soft, elegant, modern with an edge. Now that artwork is out of the way, one final major component in this dining room makeover is to get a beautiful piece of natural stone to crown the custom credenza. I LOVE this sensational kitchen by Stacey Cohen Design for this sleek yet inviting aesthetic and its stunning mix of light colored wood with white marble. 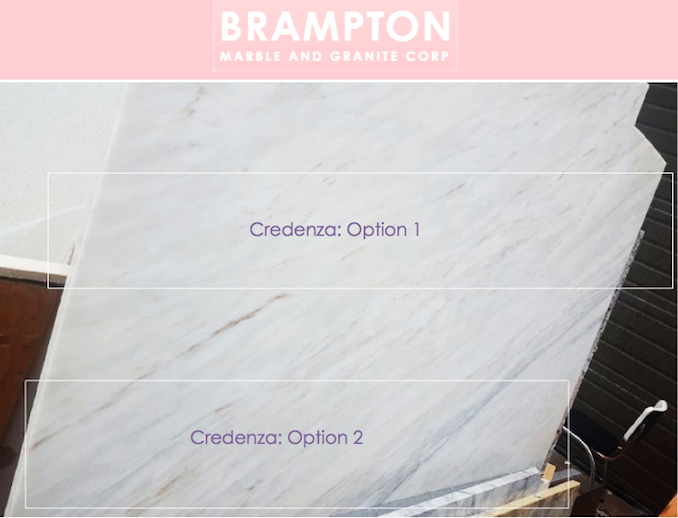 Since I only need about 72" x 17" to top my credenza, I decided to check out the remnant selection at Brampton Marble and Granite that fits the budget (after all, there isn't much budget left at this stage of the makeover). And I got really lucky because a breathtaking piece of Calacatta marble was available at approximately 72" in length! I quickly sized out my options and before I knew it, my marble was ready for delivery! Ready for another sneak peek? Maybe I am sharing too much already but I simply couldn't hold back my excitement! 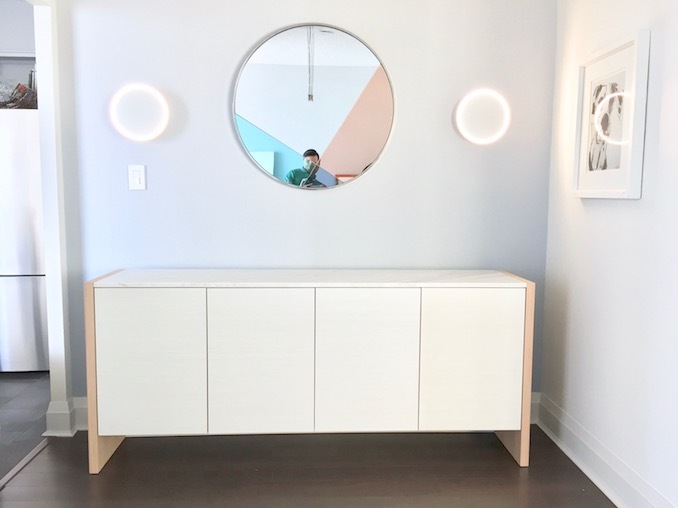 I am crazy about my fabulous mirror from HomeSense #myhomesense and aren't those Horizon wall sconces from ANONY incredible? Ok ... That's it for now. I have lots to do but Week 6 is almost here and I can't wait to show you my new dining room! 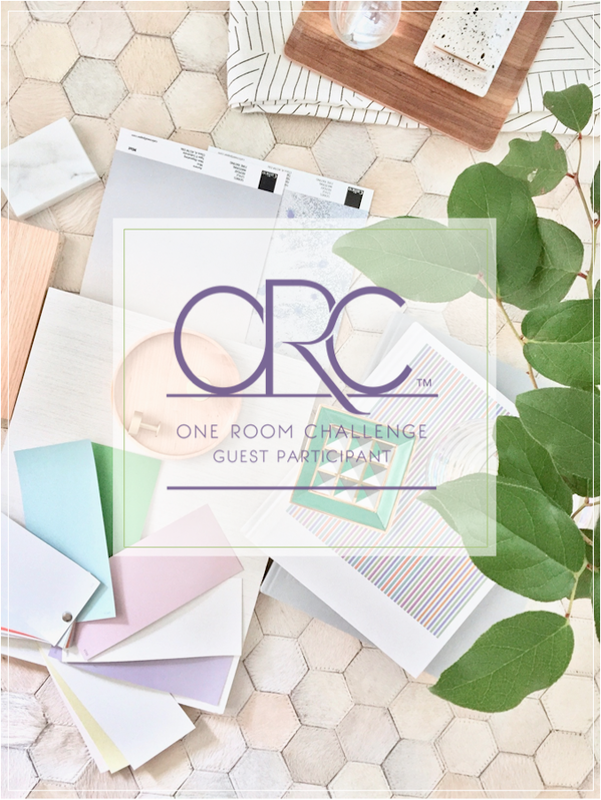 In the meantime, be sure to check out the 20 featured designers and my fellow guest participants! It's going to be amazing Tim! Your are so talented to create your own art! And yes, the sconces are incredible! awww thanks Jennifer! love adding an extra personal touch to the room! thanks for dropping by Susie! Now I have to go check out yours! I feel like I've seen that same mirror in West Elm or somewhere - total score if you found one in Homesense! And yes, the sconces are indeed incredible! west elm did have a similar one but was discontinued! I am really lucky to have found one at HomeSense! Loving that mirror too and I swoon for marble! It's going to be fabulous! Thanks Kim! That mirror is really a stunner and the marble, I got really really lucky! xoxo Kristin! It took me quite a bit of time to figure it all out but it's surely good! Wow, I am loving the direction you are going with the geometric shapes! This is going to be so cool - I can't wait to see the reveal! Thanks Julie! 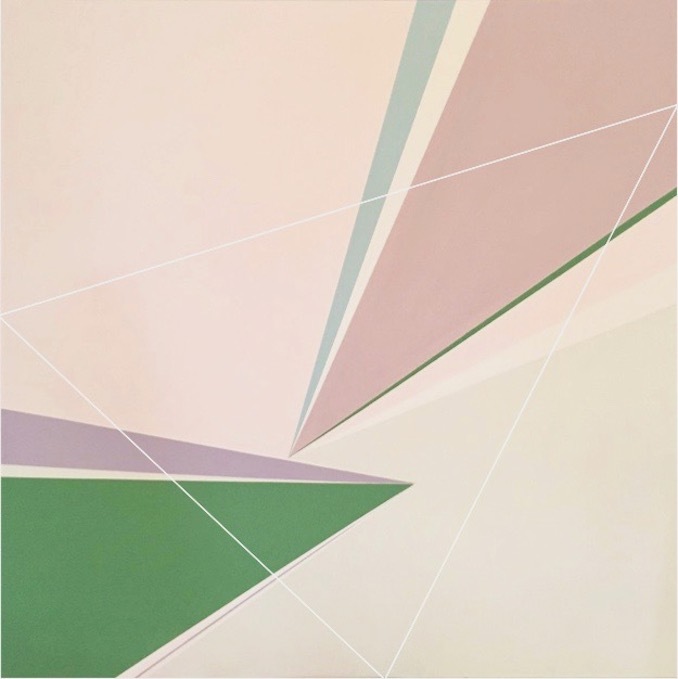 I am loving all things geometric shapes these days! Your attention to detail always amazes me! 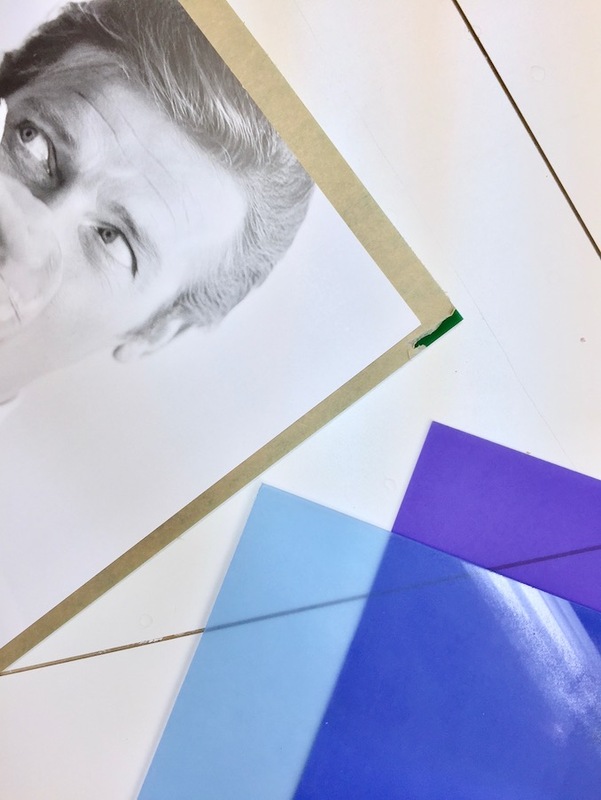 Your art is going to look beautiful in the room as is your acrylic-frames Shaken not Stirred photo. All good things, Tim! oooh i am dying over that credenza! looks fantastic! Thanks Cassie! I couldn't be happier and that marble ... LOVE! Wow! You nailed it! Cannot wait until the Reveal! awwww!! Thanks Lesli! Now I need to make sure everything works before the photoshoot! That credenza looks amazing! Good luck completing the space. xoxo Delia! I will need that this weekend for the final push! 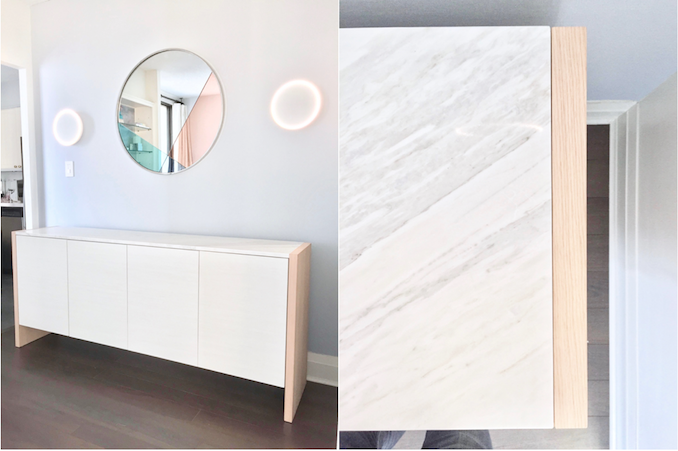 Ohh love the credenza & sconces Tim! Also, that frame for the Bond print is fantastic, cannot wait for your reveal! TYTY Jana!! I can't wait to see your kitchen all done too!! Totally amazing and those scones are to die for. I have two pieces of Kal Mansur. His work is so beautiful. I truly love everything you have done and can't wait for the reveal! Thanks so much!!! Yes I love the sconces and can't wait to show them off at the reveal and oh yes, Kal's work is amazing isn't it?